Why are they called "Historic Gardens"? The Gardens were opened in 1981, and are called "historic" because they represent more than four centuries of gardening methods and plant materials, providing a glimpse of gardening through time. How long does it take to visit the Gardens? 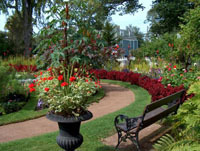 The average visitor takes about an hour to visit the Gardens, but the length of time really depends on your interests. Many people like to wander in a leisurely way, resting on our benches and soaking up the beauty. And the shutterbugs are guaranteed to spend extra time trying to capture that perfect shot!